Gold futures declined to a fresh five-month low on Tuesday. Further losses were suppressed by a weaker U.S. dollar. Gold for February delivery tilted down $1.10, or less than 0.1%, to close at $1,220.80 an ounce on the Comex division of the New York Mercantile Exchange. That is gold’s lowest settlement price since July 5. Gold traded from an intraday low of $1,214.60 to a high of $1,225.80. On Monday, the precious metal tumbled 2.3%. "Despite a small short-covering rally today, gold is susceptible to further pullbacks. Right now a stronger crude market and lower dollar are the only things that keep gold higher," Reuters quoted Frank McGhee, head precious metals dealer at Chicago commodities brokerage Alliance Financial LLC. Silver for March delivery closed down 22.4 cents, or 1.2%, to $19.07 an ounce, ranging from $18.98 to $19.34. Prices sank 3.7% in the prior session. 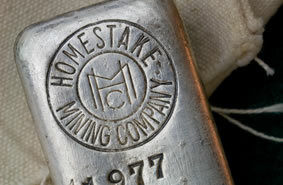 January platinum added $9, or 0.7%, to $1,355.80 an ounce, trading between $1,341.10 and $1,359.20. Palladium for March delivery gained $1.40, or 0.2%, to $714.80 an ounce, ranging from $709.60 to $716.35. Sales of the two most popular U.S. Mint bullion coins advanced Tuesday. The one-ounce American Eagle Gold rose 9,000 and the one-ounce American Silver Eagle climbed 110,500. Listed below are sales across all United States Mint bullion products. In numismatic coin news today, the uncirculated Gold Eagle sold out with sales around the 7,134 mark.